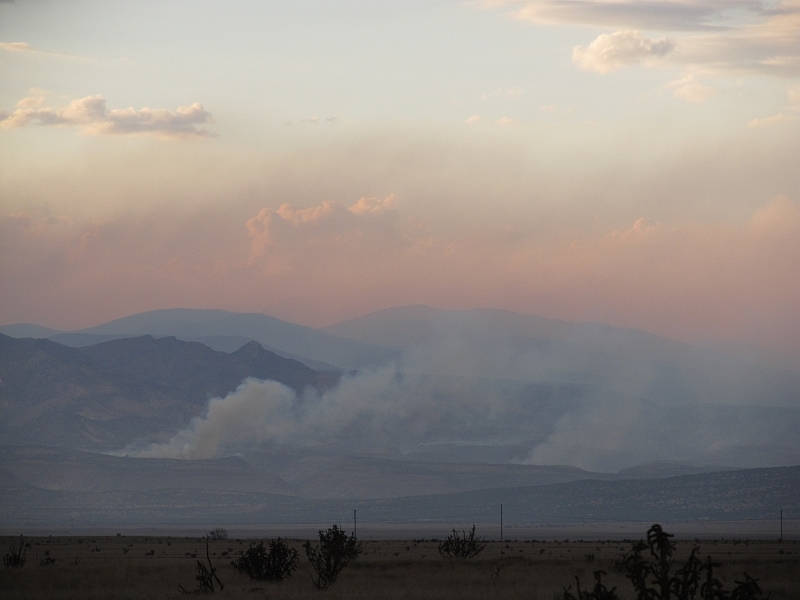 The Las Conchas fire is now officially the biggest wildfire in recorded New Mexico history, and it is not fully extinguished yet (although at least nowadays I can actually see the Jemez range on my way to work – this is a vast improvement). The following record is for the fire as of July 20, 2011. The fire is currently 75% contained, which is good since the state is so dry right now that there are places where the cacti are starting to shrivel. The photo to the left was taken around July 4th and shows the smoke from the main fire as well as a smaller new fire started from a lightning strike by Cochiti Lake. As our Great Outdoors smells like a pit smoker, I’ve also had a lot of BBQ cravings lately. 500 Fire location at approximately 35.812 latitude, -106.544 longitude (as of July 20, 2011). 500 Fire began at approximately 1:00pm on June 26, 2011 when an anonymous tree fell on a power line. 650 0 Wildfires |zNew Mexico. 650 0 Cancer |xEnvironmental aspects |zNew Mexico. 650 0 Animals |xEffects of fires on. 650 0 Barbecuing |xNew Mexico. 2. 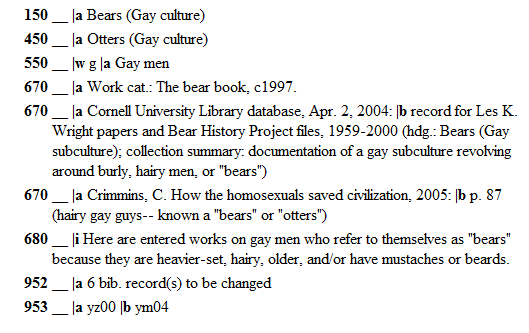 There is an authority record, complete with scope note, for the topic “Bears (Gay culture. )” I actually kind of love this, and any LOC record containing the word “burly” is pretty fantastic. Also, I did not know that Bears may also be referred to as Otters, which makes me wonder if that term is obsolete. Bears of teh internets: How do you feel about being called Otters? *Disclaimer: This record, in all its hypothetical greatness, was not actually entered into any existing catalogs. Any mis-appropriations of MARC fields are not intended to offend any catalogers that have more experience than myself in cataloging wildfires.